Labour productivity is a measure that rolls up from personal and organisation metrics up to country level. The UK, when compared with other G7 countries hasn’t been doing so well for many years (UK is currently 16% below the others). The latest Office for National Statistics (ONS) bulletin on UK productivity highlights that “UK labour productivity, as measured by output per hour, is estimated to have fallen by 0.5% from Quarter 4 (Oct to Dec) 2016 to Quarter 1 (Jan to Mar) 2017; over a longer time-period, labour productivity growth has been lower on average than prior to the economic downturn.” Can modern tools such as Microsoft Delve with Office 365 help? In a recent study “Productivity in the UK” by Capita Workforce Management Solutions, they found that two-thirds of staff waste at least an hour a day at work and just a third of managers feel that their business is very productive. 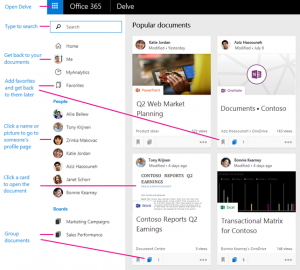 Microsoft Delve allows Office 365 users to be presented with, search and manage their emails, meetings, contacts, social networks and documents. Based on the Office Graph learning engine, the solution shows users relevant people, conversations and content based on their activities by using machine learning and AI. This is a productivity tool that goes further than digital document management, it is there to promote document collaboration and facilitate employee interactions. Using enhanced functionality around those areas which slow us down – content search, finding the right person to engage with, being able to work fully mobile etc. – it is a 360 degree solution that touches all the ways we carry out our work. To start your journey with Delve, simply fire it up first thing to get you up-to-speed with the day (even using a dedicated mobile app on the train on your way in) and get bite-sized snippets of what you need to know to get going. For more information on Microsoft Delve, watch the video and speak to our collaboration specialists at Prodware about how Office 365 is being further developed to boost productivity.